1. Sooth puffy and tired eyes – the most common use of tea bags. Staring at a computer, reading, watching, almost everything we do daily challenges our eyes. Tea helps relieve redness and swelling and refreshes tired eyes. Put the tea bags in ice-cold water or simply pour on water and leave in the refrigerator. We suggest you use them at bedtime, while resting your eyes. This is pretty much all you need, with absolutely no cost. 2. Tea bags help with sweaty feet. Soak your feet in luke warm tea prepared with used tea bags before bedtime for 15 minutes and wipe with a clean towel. 3. Minimize the effect of bruising. Tannic acid, contained mostly in black tea, has the ability to restrict swelling by constricting the blood vessels. Apply a fresh, cooled bag of black tea on your trauma and leave for 20 minutes. For better results repeat once more during the day. 4. Tea bags are a remedy for minor sunburn. Wet tea bags ease the pain of sunburns. If bigger areas of your body are affected, try to take a cool bath adding several tea bags to the water. 5. Tea bags help with razor cuts. Wet tea bags sooth pain from razor cuts. Use a cooled tea bag to stop the bleeding and reduce skin damage with the helpful antioxidants found in tea. 6. Tea bags help with acne. Wipe your face with used green tea bag. Before you rub a tea bag on your skin, wash and rinse the skin with a hypoallergenic cleanser. Apply the cooled tea bag on the skin and let it stand for 10-15 minutes. Rooibos tea is one of the best options for acne treatment. Rooibos, also known as Red Bush, is a plant native to South Africa and has been used in the local traditional medicine for centuries. 7. Tea bags help with oral hygiene. Speed up the healing process of painful sores in your mouth by slightly biting onto a tea bag soaked in water. 8. Tea bags can freshen your breath. Bad breath usually is due to a number of reasons such as eating smoking, dry mouth or other medical conditions. Bad breath is caused primarily by the bacteria on the back of your tongue or between your teeth. Both green and black tea can stop the growth of the bacteria. Rinsing with strong brewed tea reduces the unpleasant smell from the mouth. Use 2 or more used tea bags to prepare a new cup of tea. Let it come to room temperature and the use to clean your mouth. For better result repeat daily after meals. 9. Tea bags effectively absorb unpleasant odors. Tea can help reduce unpleasant smell of hands such as fish or garlic. 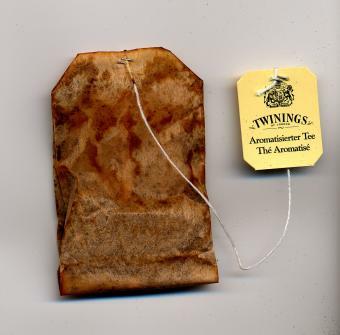 In addition, tea bags can be used inside the fridge or you can stick them in the trash can. You can also use them in ashtrays to reduce smell. An other idea is to stick dry tea bags with lavender flavor or other herbal tea of your choice in the seat covers of your car to get a natural air freshener. 10. Tea bags could be used for washing dishes, especially if you are allergic to soaps or other detergents. No matter how strange it sounds, tea does have cleaning properties. Using a bunch of re-brewed tea bags, you can easily remove dirt or grease from mirrors, windows, floors, kitchen counters or other wooden furniture. Remember that after cleaning, make sure to dry the surface, because tea is also a good natural dye! This entry was posted in Home, Car, Yard, and Pets, Tid-Bits & Funnies, ~Cleaning, ~Recycle & Upcycle and tagged acne, bags, breath, bruising, cut, cuts, eye, eyes, feet, hygeine, minor, Odor, puffy, Razor, repourpose, sooth, sunburn, sweaty, Tea bag, teas, tired, unpleasant, use, uses. Bookmark the permalink.